Impress your family and guests with a gourmet breakfast that goes beyond rolls, scrambled eggs, and toast. Select a set of recipes that fit together and provide plenty of options for a crowd large or small. Bear claw pastries - Bear claws are a traditional breakfast pastry. Make these the night before and zap in the microwave for a few seconds before serving. Crepes station - With a small group, you can set up a crepe station in your kitchen. 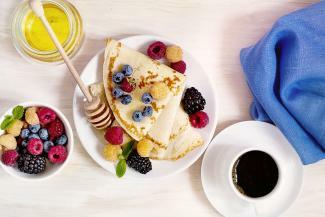 Prepare a couple gourmet crepe fillings, like savory chicken with asparagus and sweet chocolate with raspberry, so everyone can select their favorite flavors. Vegetarian crustless quiche - Add some protein with a crustless quiche recipe that features a variety of vegetables. Quiche is always an impressive dish to add to the table. It will also be easy to manage with the other dishes, as you can bake it while you prepare the crepe batter. Sugar and spice bacon - Cook bacon with a sugar and spice rub that features a little kick after a hint of sweetness on your tongue. Exotic fruit with dip - Visit your local gourmet grocer to pick up some exotic fruit choices like kiwano melons and lychees. Cut and serve them with marshmallow fluff fruit dip. A large group means you need lots of options. Plan some ideas that can be done ahead of time and others than have to be baked fresh in the morning to provide the ideal mix for groups larger than 10 people. Gourmet muffin spread - Bake a variety of gourmet muffin flavors, from chocolate cinnamon cashew to raspberry caramel streusel to triple chocolate, for a variety that will please a crowd. Heirloom tomato tart - An heirloom tomato tart recipe can be doubled for a large crowd. The crust can be fully prepared ahead of time, making putting this hot option together in the morning quick and easy. It will take no time at all to melt the cheese since the crust is done. Blueberry French toast casserole - This freezer casserole recipe for blueberry French toast is something you can prep days ahead of time. Casseroles are known for serving a crowd and adding the fruity flavor to traditional French toast elevates this to gourmet status. When this is done cooking on the day of your gathering, pop the tomato tart into the already warm oven to melt the cheese. Elegant deviled eggs - Vary a basic deviled eggs recipe by including gourmet add-ins like roasted almonds and wine vinegar or swapping mayonnaise for herbed cream cheese. Ambrosia salad - The traditional ambrosia fruit salad side dish is a lovely option for a breakfast that goes beyond basic cut fruit. Just because you want to serve a few elegant options, doesn't mean you have to be stuck in the kitchen all morning. Prepare these items ahead of time and simply finish or reheat to set up a breakfast bar for any size crowd. Apple butter with artisan bread - Pull out a jar of homemade apple butter and put into a serving dish. Bake some artisan bread a day or two ahead of time. Slice and cut in half for the perfect size for a breakfast bar. Bacon pastry twists - Make the dough for bacon pastry twists the night before and pop in the oven the morning of the breakfast. Keep them warm in a lined roaster pan. Blueberry muffins - Tasty blueberry muffins are a crowd-pleasing favorite. The cream cheese filling and topping add a little something special to this traditional recipe. Ground turkey breakfast sausage - Skip traditional sausage links and instead put together your own homemade ground turkey breakfast sausage patties. Cook them the day before, then reheat in a roaster so everyone can enjoy them. Using ground turkey means less fat drippings, so you don't have to worry about how the sausages will fare sitting in the pan. Orange cranberry slow cooker oatmeal - The orange cranberry oatmeal flavor combination will tempt everyone's taste buds as the scent wafts through the house. Get it started the night before and it'll be ready to serve in the morning. Kona coffee - This coffee is from the Hawaiian islands and has a delicious flavor all its own. Fresh fruit infused water - Select your favorite combination of flavors, from citrus cucumber to watermelon basil, for a gourmet alternative to juice. Homemade hot chocolate - Skip the packets and create your own hot chocolate for guests to drink if the weather is cool on the day of your event. 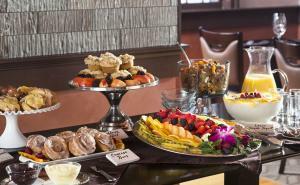 No matter what menu you're serving for breakfast, the details will help turn a basic breakfast into a gourmet option. Select a fancy tablecloth and fold cloth napkins to hold the silverware. Skip plastic and paper plates and use your best dishes. 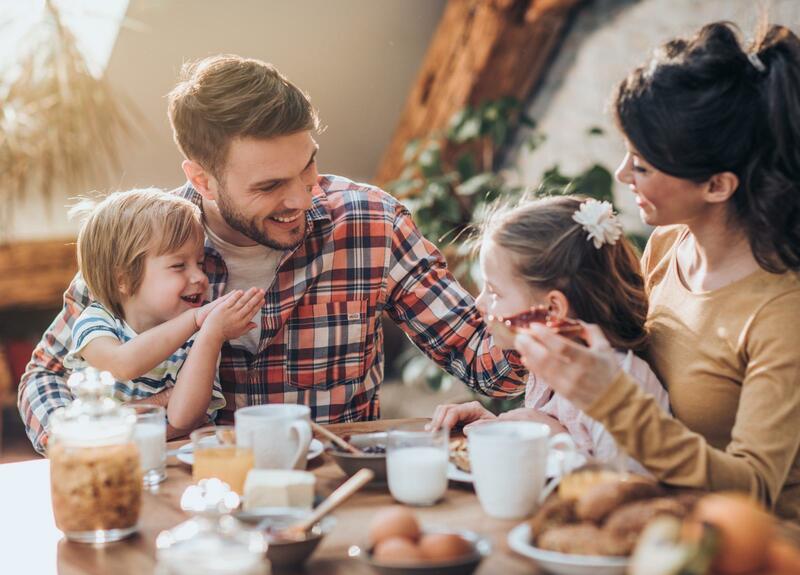 Include fresh flowers or a seasonal dinner party centerpiece to complete the gourmet breakfast experience.